Palestinian reconciliation efforts in Cairo: A fresh start? Leaders from Palestinian factions made separate visits to Cairo in an attempt to resurrect talks in the framework of the Egyptian-brokered Palestinian reconciliation process which ran aground following the failed assassination attempt against Prime Minister Rami Hamdallah during his visit to Gaza in March. The visits began with a Hamas delegation headed by Saleh Al-Arouri, deputy head of the Hamas political bureau. When those discussions ended on Friday, a delegation of Islamic Jihad officials led by the movement’s deputy leader Ziad Al-Nakhala arrived, to be followed in turn by Azzam Al-Ahmed, head of Fatah’s reconciliation delegation. All three delegations met with the new director of Egyptian General Intelligence Major General Abbas Kamel for the first time. 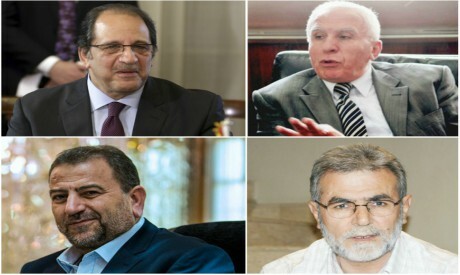 Parties interviewed by Al-Ahram Weekly gave the impression a fresh start had been made in the stalled reconciliation process. Speaking to the Weekly by phone, senior Hamas official Ahmed Youssef said: “In my opinion, and based on what I’ve heard from the delegation that went to Cairo, there is cause for optimism, especially as regards the outlook of the new leadership in Egyptian General Intelligence and their receptiveness to all ideas. He explained that through such a dialogue Cairo would be able to move beyond Fatah and Hamas’ mutual demands and recriminations, sound out all Palestinian factions and, on the basis of its findings, formulate a new proposal for ending the more than decade old schism that has fragmented the Palestinian cause. According to Youssef, a vision exists for restructuring the Palestine Liberation Organisation in a way that might lead to the inclusion of Hamas and Jihad though the idea still needs fleshing out “so as to make it possible for us to realise a comprehensive umbrella that embraces all Palestinian national forces in order to contend with the current challenges, foremost of which is the so-called deal of the century”. The Hamas official added: “What I have understood from speaking with officials in the Palestinian Authority [PA] and people close to President Mahmoud Abbas is that they share a sense of anxiety and a belief in the need for some kind of mechanism to emerge from the current dilemma. Palestinian reconciliation has run up against obstacles other than the assassination attempt against Hamdallah. Although Hamas dissolved its Gaza administrative committee, and thus removed what had been a major spanner in reconciliation efforts, pending security issues remain, not least the need for Hamas to hand over its weapons to the PA.
Another sticking point centred on government employees hired during the period of Hamas rule in Gaza without PA approval. Against this backdrop the Hamas website Al-Risala reported that, while in Cairo, Fatah’s Central Committee head Azzam Al-Ahmed had reiterated PA ultimatums only to encounter the insistence, on the part of Egyptian Intelligence, on the need to agree on a formula that avoided the PA’s “exclusionary demands”. In the same spirit, according to the website, Egyptian intelligence authorities refused to relay to the Hamas delegation Fatah messages that “conveyed threats or that did not contribute to forging a basis for genuine partnership in reconciliation”. “The general impression we have from the talks up to now is that there is general optimism and appreciation for the role Egypt is playing in the treatment of the Palestinian question in general,” Islamic Jihad political bureau member Nafez Azzam told the Weekly by phone. He stressed that talks were still in progress, communications were continuing nonstop and that Cairo would sustain its drive to overcome all obstacles. It is noteworthy that Saleh Al-Arouri headed the Hamas delegation to Cairo instead of Yehia Sinwar, the Hamas military leader who once declared that he would “cut off the leg of anyone who obstructed reconciliation”. Sources in Cairo and in Hamas ascribe this to the fact that Sinwar’s threat implied that Gaza was to blame for the lack of progress, and that the obstructions were military in nature, when in fact the obstacles that now need to be overcome concern the political management of the reconciliation process, and at a time when Hamas is moving closer to Cairo. Another possible reason cited for the change in the Hamas delegation head was that the recent round of talks was “exploratory”. Egyptian mediation has been active on another level. Cairo has been trying to broker a new truce between Gaza and Israel against the backdrop of escalation surrounding the Palestinian “March for Return” demonstrations. Though on Sunday Islamic Jihad announced that it would agree to a truce the terms had not yet been fixed before both sides moved towards a re-escalation. Israeli Prime Minister Benjamin Netanyahu threatened to renew military action in response to incendiary kites and balloons launched from Gaza into Israel. On Sunday evening Israel’s military announced it had reinforced its Iron Dome batteries in the south. Islamic Jihad political bureau member Nafez Azzam told the Weekly: “It is not us who are seeking escalation. We believe that confrontation is pointless and we are acting accordingly. *A version of this article appears in print in the 19 July 2018 edition of Al-Ahram Weekly under the headline: A fresh start?